The central image of The Kings Of Summer is a house—the ramshackle dream home built by its teenage characters. Nailed together from refuse and stolen lumber, it sits in a clearing of indeterminate location—close enough for the characters to be able to walk back to town, but too far away for their parents to find them. The house represents the characters’ aspirations; it’s a symbol of their yearning for independence and self-sufficiency. Inadvertently, the house also represents the film, which is uneven, haphazardly constructed, and over-reliant on hackneyed symbols of yearning for independence and self-sufficiency. 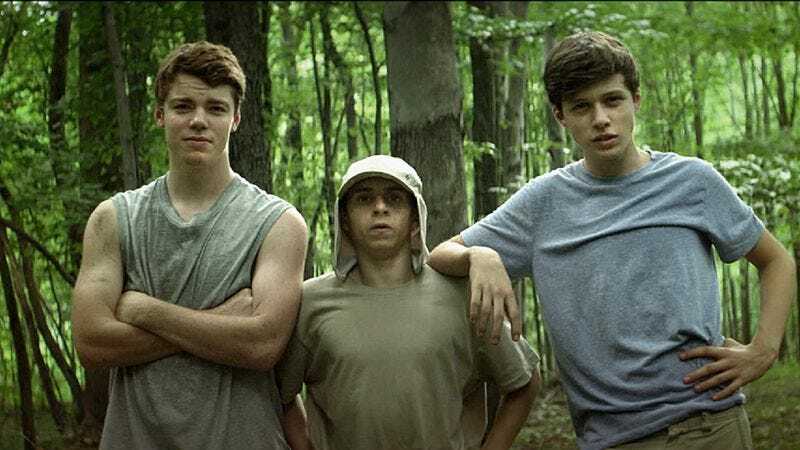 Nick Robinson and Gabriel Basso star as best friends who decide to spend their summer vacation living in the woods, away from their parents. Robinson, a daydreamer type, is frequently at odds with his widower father, played by Nick Offerman. Offerman is prickly and overbearing, though he’s a model of warmth and understanding compared to Basso’s parents, two shrill caricatures of alien adulthood played by Megan Mullally and Marc Evan Jackson. Joining Robinson and Basso on their adventure is Moises Arias—an asexual, froglike weirdo partial to machetes and mock turtlenecks. Arias is less a character than a screenwriter’s folly, existing only to make non sequitur remarks. The Kings Of Summer doesn’t take itself seriously; short of having the actors break character, it’ll do anything for a laugh. It leans heavily on interminable improv scenes and interminable montages edited from improv scenes. In other words, much of it plays like the outtakes reel that would be shown at the wrap party of a better, more tightly structured film. Certain bits fall flat, while others—say, any scene with Mullally and Jackson—grate. The humor’s tendency to veer into the surreal doesn’t help the movie seem any less inconsistent and scattered; without a sense of purpose, absurdist comedy can look an awful lot like sloppy filmmaking.